By Willie Wheeler Zkybase is my first open source configuration management database (CMDB) effort, but it’s not the first time I’ve built a CMDB. At work a bunch of us built–and continue to build–a proprietary, internal system CMDB called deathBURRITO as part of our deployment automation effort. We built deathBURRITO using Java, Spring, Hibernate and MySQL… far I’m finding it a lot easier to work with the graph database than with a relational database, and I’m finding Spring Data Neo4j to be a big help in terms of repos itory building and defining app-level schemas. The code is a lot smaller than it was when I did this with a relational database. Read the whole post here. When I first time saw the Neo4j technology I immediately thought about it’s usage in the CMDB backend. 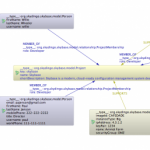 Why you didn’t use a commercial CMDB in the deathBURITTO effort? Why do you think there is no decent open source CMDB out there?